With the season six premiere of Supernatural only a week and a half away, I've got four final lists for your perusal. Today I'm going to be ranking the premiere episodes. Where will season six's fit in? We'll find out soon enough! Later this week, I will rank the finales. And next week I'll rank the seasons and finally give you my list of the top ten episodes overall. I've gone over the top five from each season, but this will be just ten from all 100-something episodes! Back to the business at hand. The premieres! The premiere episode of a season can really set the tone for what's to come. It can be awesome, or it can be disappointing. How do Supernatural's premieres stack up against one another? Let's take a look! I remember being so completely pumped for this episode after the epic season two finale. And then? Major let down. We're introduced to two hunters we never hear speak of again, the seven deadly sins weren't very deadly after all, and then Ruby randomly appeared too. It was a bit of a jumbled mess of an episode, which I guess was rather apropos for season three, which had some very high highs, and some very low lows. You see how I said the premiere episode can set up the tone of the whole season? I was not just saying that to sound smart, people. The premiere of season five wasn't necessarily bad, but it wasn't really totally awesome either. Though, just looking at Sam's puppy dog face in the graphic above, how can I resist? He has the best puppy dog expression, doesn't he? In any event! Sam was given a lot of flack for this whole "starting the apocalypse" business here and in the future as well, but what bothered me is how no one ever really addresses how Dean played a role as well. He broke that first seal, hello! Also, this episode was just the beginning of many "ah ha wow" moments that peppered season five. And not in a good way. Not only did the pilot have to set up season one, it had to set up the series as a whole. This is where we first met our erstwhile Winchester brothers and saw what happened to their mom, and eventually, Sam's girlfriend Jessica. It sets up the strained, jokey relationship between Sam and Dean, and the search for John. The only thing about this episode that I have never liked was the contained ghost story in the episode itself. Necessary to set up just what the show is about and how it generally went week to week back then, but meh. Not that exciting. Woman in white, killed her babies, killed herself. Stalks unknowing unfaithful men on highways. Yada yada yada. Again this episode just showcases season one as a whole. Episodes that focused on the overall storyline? Good. Monster of the week episodes? Ehhhh. We all remember that racist truck, people, no matter how much we'd like to forget. Oh yes. Now this is a good one. Dean comes back from the dead, and we don't know how! The brothers are reunited! Bobby! We meet Pamela and she gets her eyes burnt out! Sam's been using his super secret evil demon powers! An angel was the one who brought Dean back from Hell - and they have plans for him! My oh my, so much happened. Probably by far the most revelatory of all the premiere episodes, in terms of "oh wow" moments. The episode set up Dean's upcoming struggle with his trip down to Hell, how the angels were going to become a big part of the storyline, and Sam's use of his demon powers. There was nary a dull moment, and the same can said for season four as well. You see, I am not letting this comparison die. I'm not, I'm not. Still one of my favorite episodes of all time (uh oh, spoiler alert for my top ten episode list?!). Though there isn't a lot of action and heroics in this episode, it's still really engrossing. Dean's dying, Sam doesn't think John is doing anything to help, but meanwhile he's working to summon the yellow-eyed demon to make a deal to save Dean. The Impala is smashed to bits. 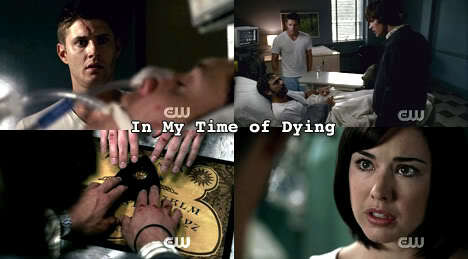 Dean struggles with the idea of death and letting go, and just when he's about to do it, he's brought back. John tells him some super special secret we don't hear for a while... Okay now I'm just describing what happened. You know what happened, I'm sure. If you're reading this, I would think you do. If not, why are you reading this? Weirdo. This episode was just downright great, and in the end when John actually dies? I'm not sure how many people actually saw that coming, but it set up a lot of what the boys would be going through over the course of the season, how they are constantly sacrificing themselves for each other. Awesome. 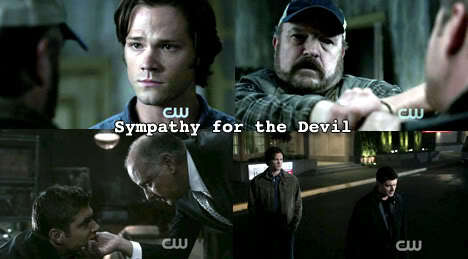 IMO, it wasn't about the other hunters who knew Sam released Lucifer, it was what Dean said to Sam in the parking lot at the end of Sympathy for the Devil. I do not remember any time Dean blamed Sam for Lucifer, only the blood drinking and demon banging. I think this is your first list where I've completely agreed on your order. This is my order of the premiers exactly. 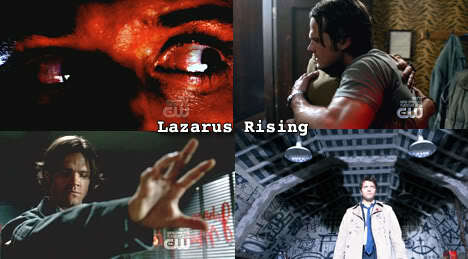 In My Time of Dying is one of my favorite episodes, and so is Lazarus Rising. I disliked Magnificent Seven a lot, and although I loved most of season five, Sympathy for the Devil was one of the weaker episodes. You should totally do an list on the season enders to0. "but what bothered me is how no one ever really addresses how Dean played a role as well. He broke that first seal, hello!" To me, those are completely different things. Dean gave in after 30 years in hell. Most people would have given in a whole lot sooner, and I can't really blame him for that at all. On the other hand, Sam has no excuse at all. Frankly, season 4 Sam angered me a lot. His brother went through hell and is back, and yet he chooses Ruby and keeps doing stupid things he should have known better than to do. Sam had a whole lot more choices than Dean and was in his right mind and not being tortured. Agree with you 100%. I love your lists Jen.